For a long time, I have adored Mr. Darcy and the characters from Jane Austen’s novels. As a fashion obsessed history nerd, I have also fallen in love with the fashion of their time. The reason for my learning to sew was that I, too, wanted to wear the beautiful clothes I saw in pictures and films. Because medieval clothes did not require advanced sewing skills, I started there. Then I went on to Regency fashion, using “Reconstructing History” patterns. As an impatient, penniless student, I chose to sew my Regency underwear out of old bedsheets, on the machine. In the corset I used plastic boning. Recently, I improved the chemise and corset. The white muslin dress is the only part of the costume that I have bought fabric for. It is mostly hand sewn. In the hopes of making it my passport to a formal historic tailoring education, I made an effort to show my abilities, with correct materials, precise pleats and invisible stitches. As I lacked experience within all other fields of tailoring, I was not accepted. I have enjoyed my dress at picnics though, feeling beautiful, but awfully cold. Two years ago, I made removable sleeves for it and a matching bonnet, out of an old sun hat and fabric leftovers. 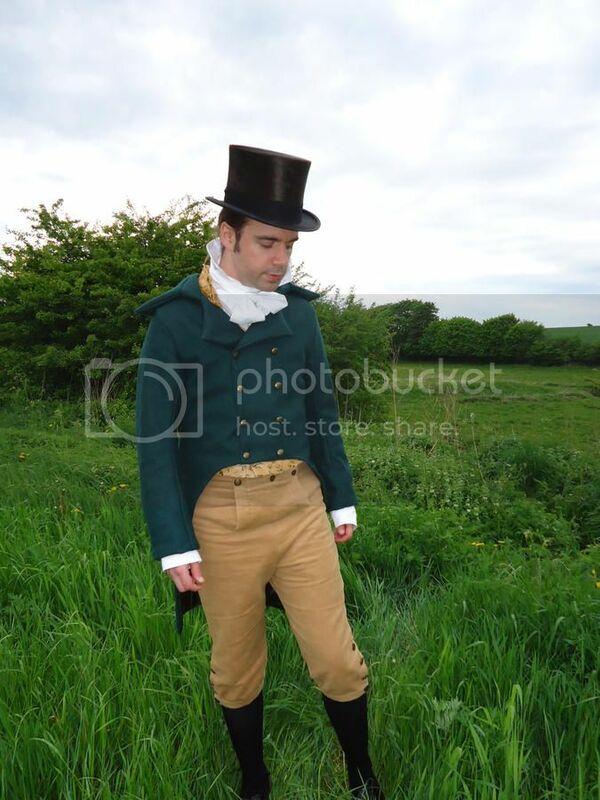 Last year I made a Regency outfit for my husband. I used both bought and homemade patterns to finally achieve a costume that comprised of a cotton shirt with cravat, fall front knee breeches in moleskin, a satin waist coat and a woolen frock coat. The shoes, stockings and hat were bought. Researching men’s clothing awoke cravings for outdoor clothes for me, so after completing Christian’s outfit, I decided to set for a spencer and hat. I used the green velvet from our old sofa! Regency fashion reflects contemporary events. The French Revolution got rid of the “suppressors’” fashion and a new style was born. The Napoleonic war inspired military decorations. I suppose the popularity of the second Earl of Spencer explains why the accidentally-created spencer became the fashion. My outdoor clothes are good representations for my thesis; both the hat and the spencer are feminized (and of course) “unpracticalized” uniform pieces. The spencer is completely hand sewn. It closes with hooks and eyes, and a drawstring at the waist. I almost went mad when trying to attach the ribbon to the deep nap of the velvet, which continually pushed the ribbon in the wrong direction. The inside of the spencer is lined with cotton leftovers. The hat gets its structure from cardboard from old notebooks. The pieces are hand sewn and glued together. 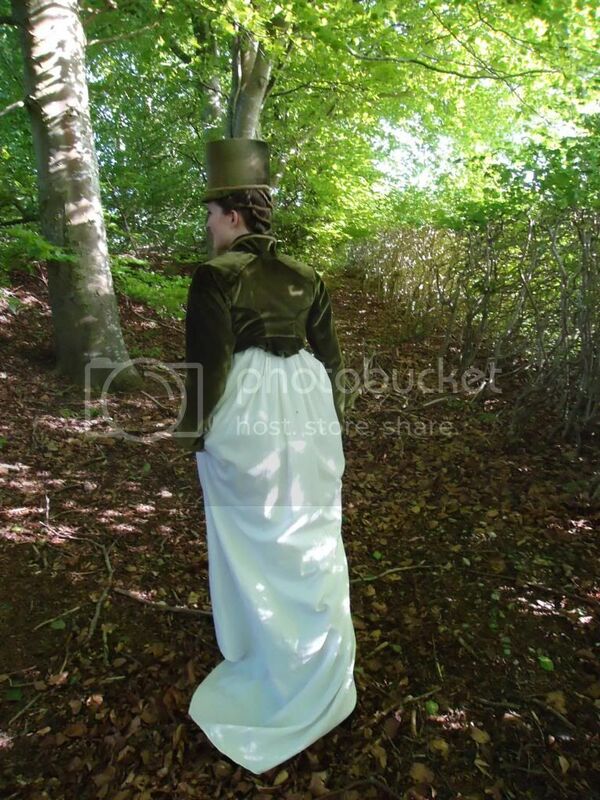 I have not made exact copies of historical pieces, but translated my favourite things from the Regency era to what might pass for contemporary and what suits me and my purse (and after I saw Vanity Fair, I could not refuse the stylish hat, even though it should go with the trainless dresses that came later). The outside is always prioritized before the inside, where I cheat as I like when I sew for myself. This is a philosophy that actually seems to have been practiced even then. My primary aim, though, has always been to create something that I would want to wear, and I succeeded! This is a wonderful ensemble from chemise outward, but I especially adore the Spencer. Beautiful choice of material and color, and the peplum at the back is splendid. Love your top hat, too! I especially admire what you have accomplished using "materials on hand" - really encouraging for those of us bemoaning the potential costs of historical costuming - well done! Thank you so much for your encouraging comments! I'm so glad that you like it! And I'm so pleased that my work can give inspiration to others (awsome!). Yes, historical costuming is awfully expensive, so I have just been forced to accept that cheap, incorrect materials will have to do until I have a better economy. And meanwhile, I actually find it challenging and stimulating to find these solutions. These outfits all look really lovely, you've done really well to transform materials you had to hand into lovely Regency costumes. They certainly don't look like bedsheets anymore! The green colour is just lovely, perfect for this period and it really suits you too. I definitely agree with you when you say that they used to cheat on the inside of garments. I work in a historic textile collection and some of the costumes in the collection look beautifully finished on the outside and then the inside is awful. I think they often did have a philosophy of 'as long as the outside looks good, anything goes'! PS: How could I forget to mention, I love BOTH of your hats! YAY for Regency! And the fact that you made the underpinnings out of old bedsheets really tickles me--I fancy that while Anne Eliot likely never resorted to such drastic measures, it stands to reason that Marianne and Elinor probably did! Elizabeth and Jane? Hmm... I'm not sure. All I know is that YOUR Mr, Darcy is quite dashing! Thank you for taking some personal liberties--I believe you are most correct and that ladies would dress not only to suit the fashion, but also their own personal tastes and preferences. Amazing job, really! I did not see these last two comments until now. Wow! Thank you so much! I am overwhelmed by your positive response. Haha, than you, Dani. I am very proud of my Mr. Darcy!